When I did my first tests and calculations about the use of solar power to drive a PC I was quite amazed at the inefficiency of the process and today’s ‘laboratory conditions’ test proves just how much room for improvement there is. It’s thanks to devices like UMPCs that this is project is at all possible because I really doubt it would have worked with even a ‘power saving’ notebook PC. Today I stayed at the campsite and put the Solar panel and Li-Ion battery through a 3 hours test. Its was a cloudless day with a very thin haze, 22 degrees centigrade and for reference I’m located at about 50 degrees north and 7 degrees east. The date is the 30th of August which is heading towards Autumn here in Germany. 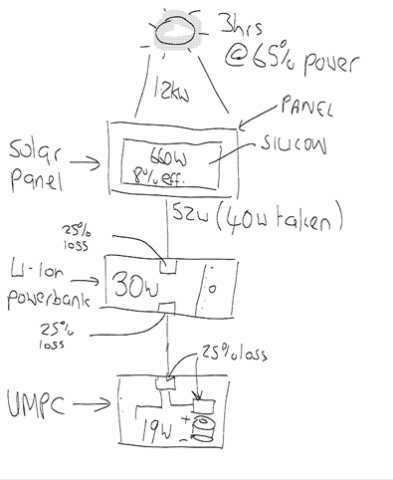 The test was done from 11:00 – 14:00 and I took the empty Li-Ion battery and charged it with the solar panel for 3 hours. I spent the rest of the afternoon trying to work out how this process could be improved and I’ve come up with a list of ideas that could help. I’ll talk though them in the next post but right now I need to put some more cream on the back of my legs because through all the concentration I forgot about the sun and I’ve burned the bit right behind the knee. That’s going to be really enjoyable tomorrow when I make the 70km dash to Bonn. Here’s a diagram I created quickly on the Q1b. Hopefuly it makes things a bit clearer. How would you improve the architechture?